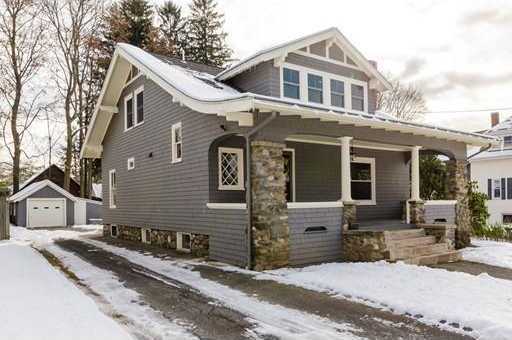 Classic American Craftsman Style Bungalow located in one of Haverhill’s more desirable neighborhoods. Once you enter the beautiful foyer, you’ll immediately notice the birds eye maple staircase and the large gum wood maple pillars. Leaded glass doors adorn the built-in china cupboards and the inviting living room is complete with a fireplace; features one would expect in a home of this era. Lovingly cared for this home has had many updates by the current owners, some of those updates include a convenient first floor full bath with granite and porcelain tile. The original 2 maple hardwood floors have been refinished, the inside is freshly painted, the exterior has new paint and new roofs on the house and garage. The den on the first floor could be a perfect guest room or third bedroom. Set on a flat lot, this home is ready for a new owner to complete its transformation, will it be you? Imagine the possibilities.